I never want to go back, I don’t want to slide into another set of lederhosen, I don’t want to sing another verse of Ein Prosit, I don’t want to eat another bretzel or taste another pork knuckle, I fear even beer, that beautiful golden nectar, I have now sworn off (at least for a while). Yes Oktoberfest was a resounding success I had the time of my young life, it’s hard to imagine ever recreating it, it is hard to imagine I’d ever survive it again. 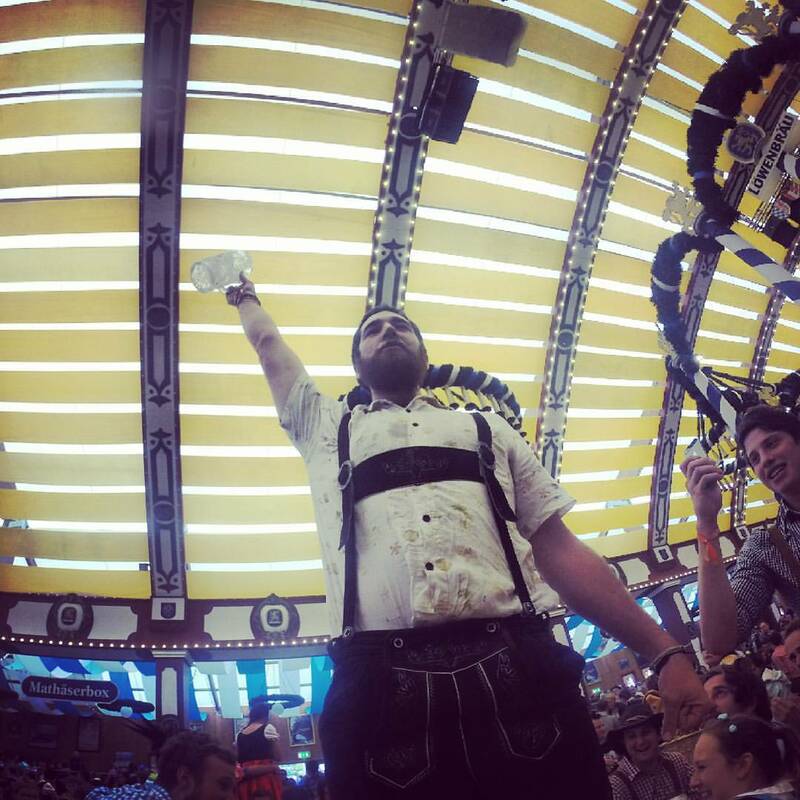 Oktoberfest was the definitive party of my partying career. 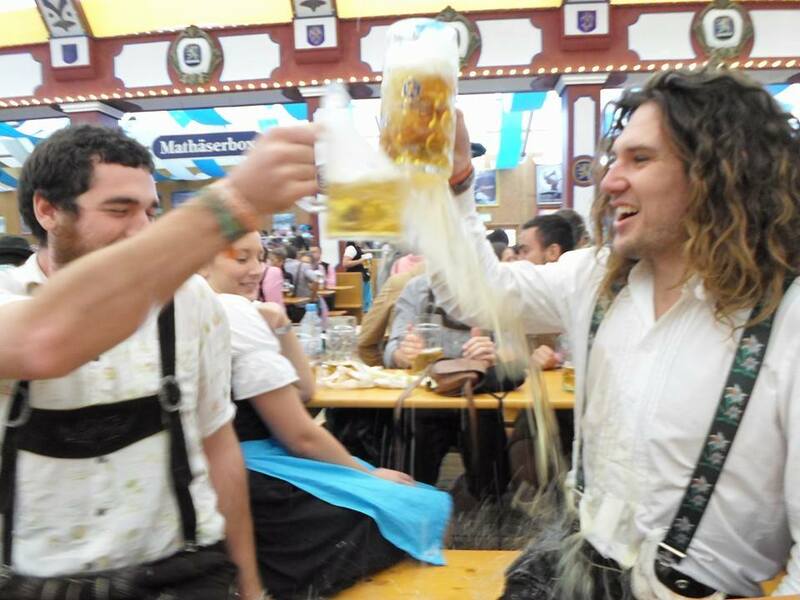 Here are a few facts about Oktoberfest, the place is full of Australians. So many of my drunken countrymen that they actually set up a temporary Australian embassy, in Munich, to accommodate all the lost passports. The first person this year to be taken to hospital due to too much beer, was exactly 3 hours and 30 minutes into the first day. There is a designated hill next to lady Bavaria especially for drunken festival goers to pass out on so that they can be monitored. Each year roughly 6 million people visit and together consume over 8 million litres of beer. 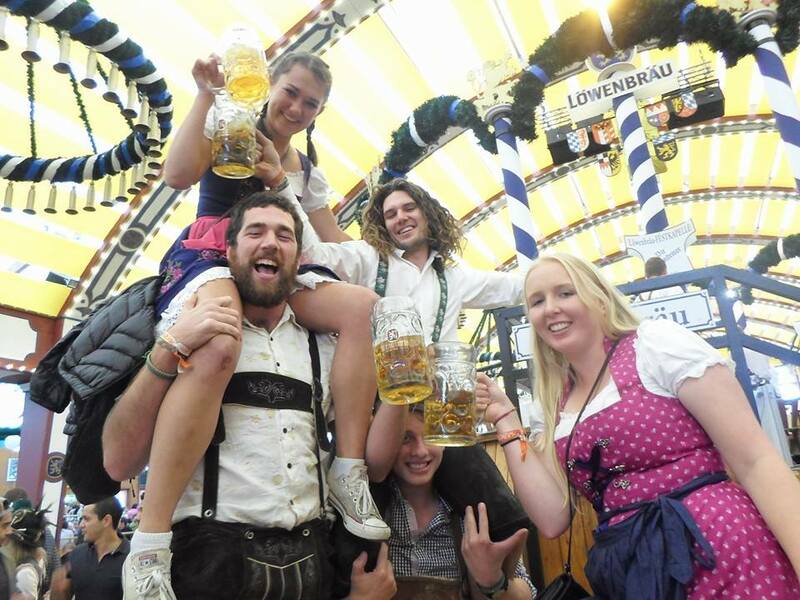 Oktoberfest is a lawless, drunken adult playground complete with rides, unbelievable Bavarian food and a cheerful spirit that seems to keep the peace, all is forgiven after the next stein. I spent 3 beir soaked days at the festival, and each day went roughly as follows. 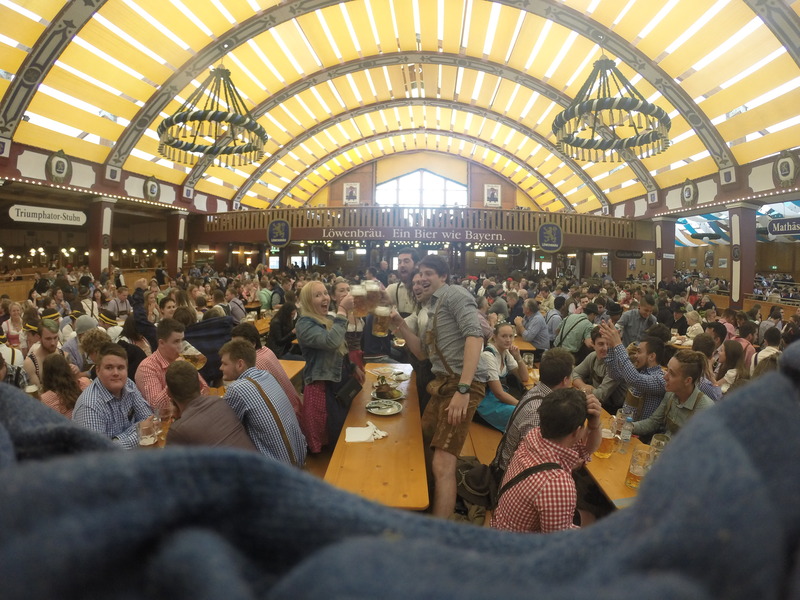 Catch the bus in, get into a beer hall for the first stein of the day, drink and eat until the first person stands up to skull usually followed by the security kicking them out. Only for them to return 5-10 minutes later to a round of applause, this goes on until standing on the table is perfectly acceptable. Sometime after that you might venture out to find another beer hall, jump on a rollercoaster and then inevitably you will lose your friends, this is the part of the day between 3-6pm. These are also the haziest moments after you lose your friends you will make new ones and continue you drinking until you find your original friends. Suddenly everyone is dancing on tables, swearing at each other, making up second later, dancing on tables, falling off tables, dancing on tables, hugging, cheering and singing until eventually everything becomes hazy once again. Then inexplicably you will wake up in your own bed, most likely helped by one of the extraordinarily friendly Munich locals, ready, or not for the next day to do it all again. I could not believe the hospitality of the locals, far from dreading the millions of tourist who flood into their city, or rather stumble around it, they take on the roles of caretakers. It’s most likely someone from Munich helping the people passed out, the ones falling over, or driving drunk campers or backpackers back to their beds. The public transport seems to be free for the entirety of the festival, whether the authorities simply give up on trying to police six million drunk people I don’t know. However, the city seems to make up for the lost revenue with the sheer number of people exploring Munich. 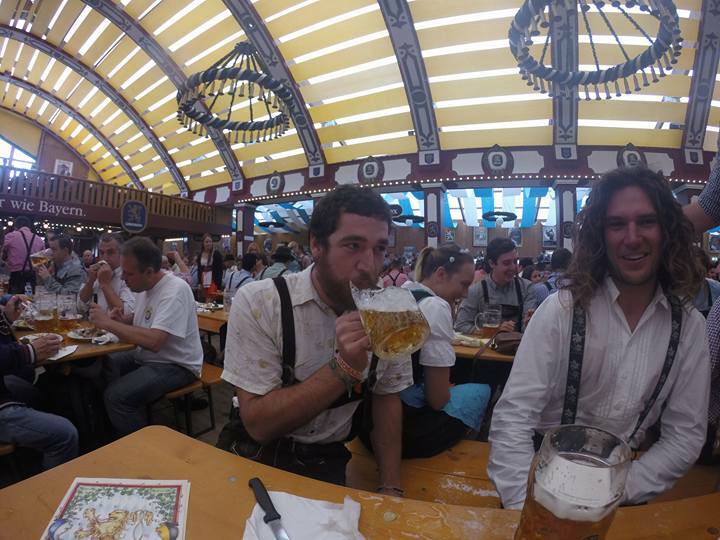 Yes, Oktoberfest almost killed me. I could off done without the two day hangover, the 36 hour bus ride at 12pm the morning after and the gaping hole in my wallet, but it was all worth it. Sometimes it does the soul good to dabble in some unregulated hedonism. I’ll be smiling to the day I die, thinking back to the memories of debauchery and decadence I shared with friends over my three days at Oktoberfest. ← What happens if we fall?